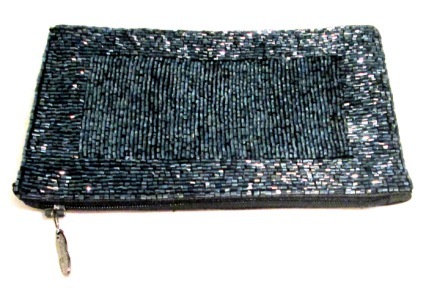 Beautiful iPurse® Rectangular Black pouch made with silk/silk blend and fine work of Dark Grey and black brown beads could hold phone, music device, spare pens, eyeglasses, keys, driver's license, cash, lip gloss, lipstick and other accessories. It has 2 pockets; one on the length side ,which has zipper and on the top with Velcro closed pocket. A perfect little travel makeup case for all your beauty needs. The adjustable strap allows you to choose the look, whether around your neck or as cross body bag. Simply depress the cord lock tabs, pull the cord to desired length and tuck the excess cord inside your iPurse®. 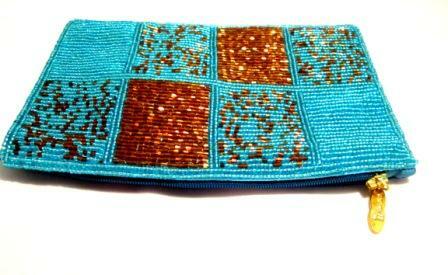 For the simplest and minimalist look, just use it as a pouch. For casual to corporate, both women and men can find just the right look from our stunning array of hand painted silks, custom embroidery and our designer line of leather, suede, beaded and exotic skins.